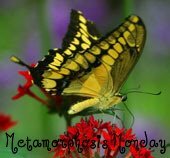 Welcome to the 263rd Metamorphosis Monday! Recently, I came across a Before and After online that just blew me away. 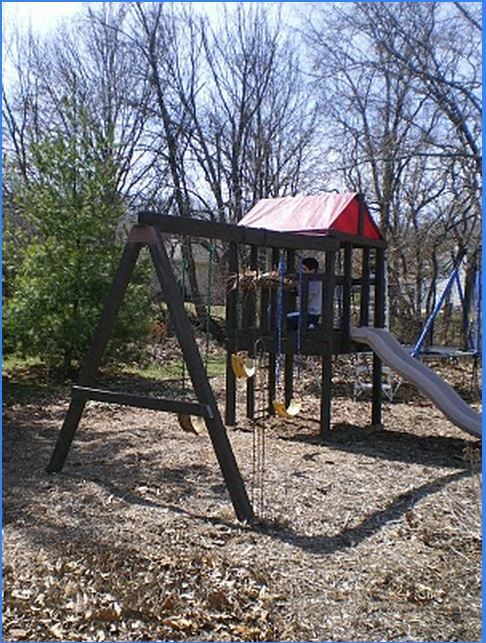 Angela who blogs at UnFussy Fussiness had a large play set in her backyard that her children had sadly outgrown and were no longer using. Shouldn’t it be against the law or something for our children to do that? They grow up way, way too fast! Angela decided it was time to do something with the play set, something that was needed and would see lots of use. Can you guess what she did? 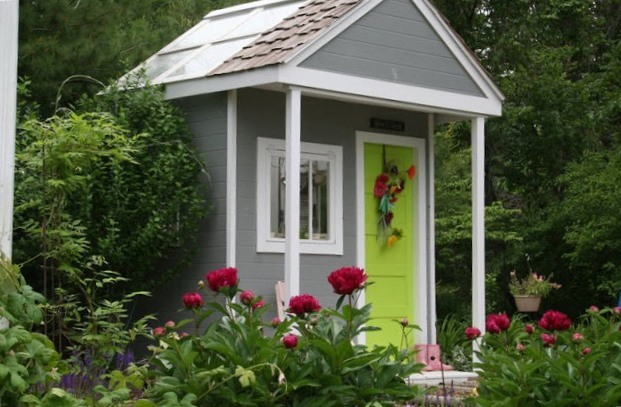 She and her family turned the old playset into an adorable garden shed! Wow! Can you believe this was once a child’s play set?! Amazingly, almost the entire shed was made from repurposed/recycled materials. Notice the old window that was repurposed to create a lovely skylight for in the roof. The cedar shake roof shingles were provided by Angela’s neighbor. He had been storing them for decades, just waiting for the right project. Isn’t that amazing? 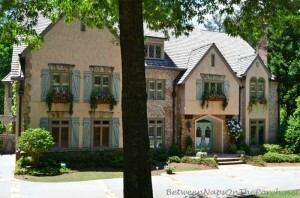 I love those cedar shake shingles! Angela’s daughter chose the wonderful apple green color for the door. I just love it, love it all! 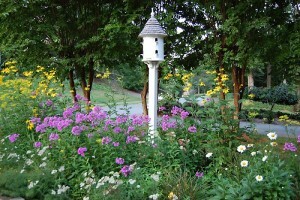 The garden surrounding the shed is sooo beautiful! What a special little haven to have in the backyard! Be sure to visit Angela’s blog, Unfussy Fussiness where you can see the construction process and the metamorphosis of the playset into the wonderful garden shed it is today. I’ll leave you with this beautiful scene of the garden at night, the shed softly glowing under the pale light of the moon. 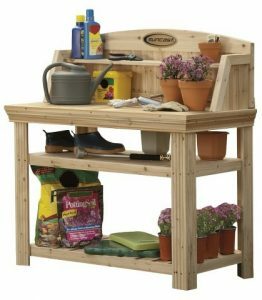 Starting to think about spring gardening? 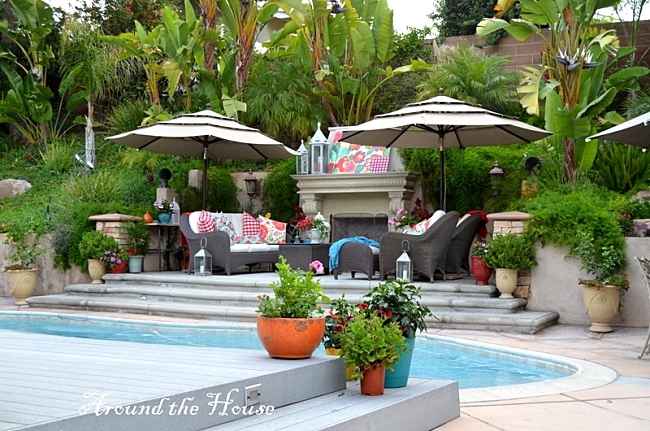 Check out this backyard paradise by clicking on the photo below. That’s a fantastic idea, Susan! I love when someone has a vision for what something can be! This is a gorgeous shed! I do appreciate you hosting and hope the weather doesn’t get too bad this week! Wow! That garden shed is amazing! What a great way to re-purpose an old play set. What a gorgeous garden shed – WOW – I’d love that in my back yard!!! 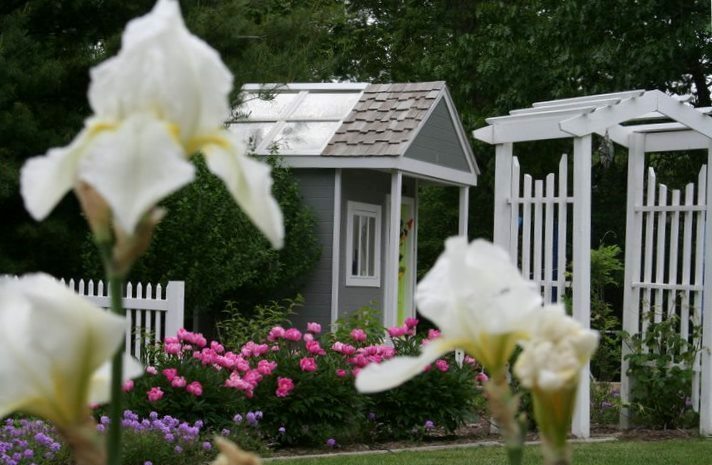 Thank you for sharing, I have been wanting a garden shed for years and this is another one to think about! Oh, what a neat idea! Love that sweet garden shed! Thanks so much for hosting, Susan – have a great week! Oh the joys of little girls and playhouses!!! Wow that is really amazing! The shed is adorable- and I definitely love the green door! That was sweet that their neighbor donated the shake shingles- what a perfect touch to the shed. I bet it’s really nice inside especially with that big window providing light and a view outside! Big sigh is right! 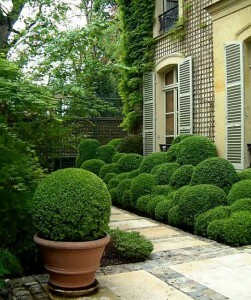 I would love to have a sweet space like that in my yard! What a super transformation! Thank you for hosting Met Monday and have a great day! Wow, what an unbelievable transformation! Amazing what some people can envision. Thanks so much for hosting again. Hope you have a great week! Brilliant idea!!!! It turned out just beautiful and so sweet. Thanks for hosting a fun party with lots of goodies to click through and pin. That pool picture makes me sooooo ready for summer. Thanks for the party — this garden house is a great idea. Sorry my title came out in all caps but the link gizmo did it automatically! I love the garden shed! My husband built one for me but he wants to put the tractor in there; what’s up with that? Met Monday’s becoming more of ‘show and tell’ site with all the recipes and other odds and ends. I was just thinking…maybe I need to set up a separate link area each Monday for the recipes…that might make more sense for those. So there would be two places to link up. Wow! We have that same play set, and now I have an inspiration picture for the future! Thanks! What a nice transformation! Thanks for hosting Susan! What a great transformation! So pretty and a great use for an old play set. Thanks for hosting! Great transformation Susan! Thanks for sharing and for hosting this week. What an awesome way to reimagine an old play gym – it’s gorgeous! Loving the arbour too. Thanks Susan for sharing it with us this week! 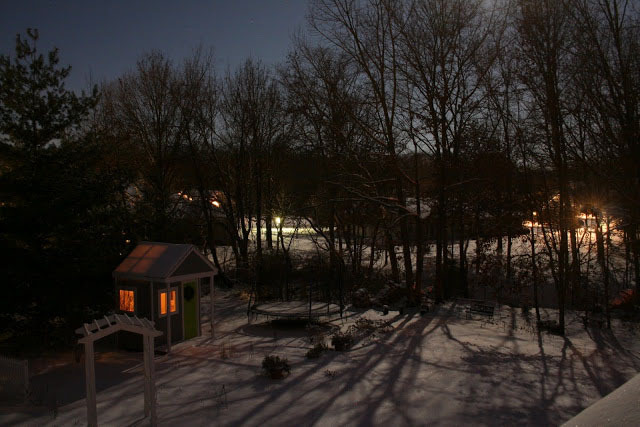 That looks beautiful, especially the night shot of the shed. And kudos for the idea, I would never have thought of that! Thanks for all the wonderful parties! The shed is such a great idea. I love the night shot. Thank you so much for featuring my garden shed on your blog. Needless to say I was stunned when I jumped on Facebook and saw my shed come through the news feed. Wow! I’m honored you chose it and happy to read so many lovely comments about it. My husband and kids are enjoying the comments too as it truly was a family project and a labor of love. It was difficult to take down the play set because it meant acknowledging my children were passing from childhood to young adulthood. (They just don’t grow up fast enough, said no parent, ever!) But learning to let go and nurture them at every stage is easier when I keep mementos of their youth nearby. I smile every time I look at the shed, whether it is covered in snow or nestled among the flowers. At least IT will stay put as the seasons come and go. One day I hope to return to blogging regularly, but right now I’m devoting my time to the moments that will inevitably lead to the next reminder of their youth that I have to dismantle in order to preserve. I remember that post and the courage it took for you to do it – – calling him to check before you did it. I’ve enjoyed the transformation of the office along the way but know it must be bittersweet for you. I just want to say thanks again for your blog and all the thought and work you put into it. It really is a special place for me. It’s the first blog I ever clicked on when I followed you there from “Rate My Space.” This whole concept of “meeting” people through blogging is still somewhat odd to grasp even after all these years, but in spite of the oddness of getting to know someone miles away through blogposts, I feel warmly welcomed by a kindred spirit when I visit. Thanks and I hope to join you some day when I can return to regular blogging. That was a genius idea.